With its rainbow of cultures, the South African food scene offers a fascinating variety of delicious dishes. The South African cuisine is a true reflection of the country's rainbow culture, it has something for everyone. From the deliciously diverse flavours of South Africa's indigenous and multi cultural rainbow cuisine to culinary specialities from all over the world. Nothing is arranged, over-handled or over-done. On the contrary, It is exciting, fresh, elegant, bursting with flavour. Served with tradition and surrounded by centuries of history, every meal is a celebration shared with joy. 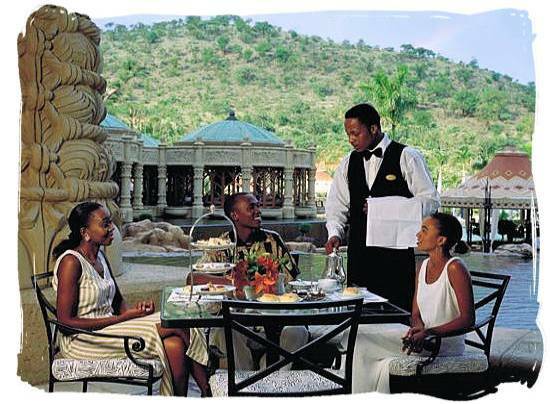 South Africa’s culinary world offers a wide range of treasures, foods and dishes including the exotic. When you do visit South Africa, don’t miss the opportunity to taste some of its unique traditional specialities. The more adventurous diners may want to try crocodile sirloin, fried caterpillars or sheep heads. All three are said to be delicious. For the not-quite so brave there are indigenous delicacies likeBobotie, "Potjiekos" (pot food) and kingklip, to name but a few. Achar is the Indian Hindi word for pickle. It is made from all sorts of fresh foods and vegetables, sliced or chopped. Mango, lime and chilli are especially popular. In one of the many methods of making pickles, vegetables are soaked in lime juice, salt and spices in covered stoneware jars which are left out in the sun for several weeks. 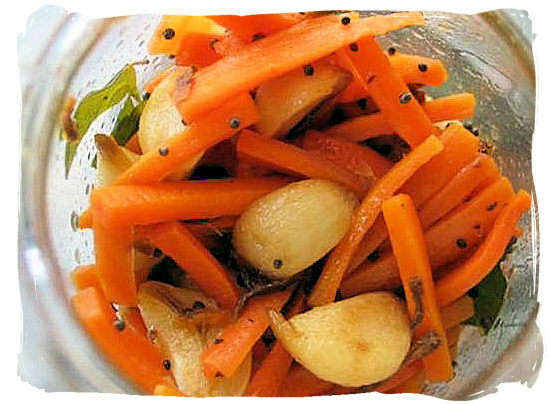 Later, cooking oil (which one depends on the vegetable or fruit being used), is poured over the pickled vegetables to preserve them. 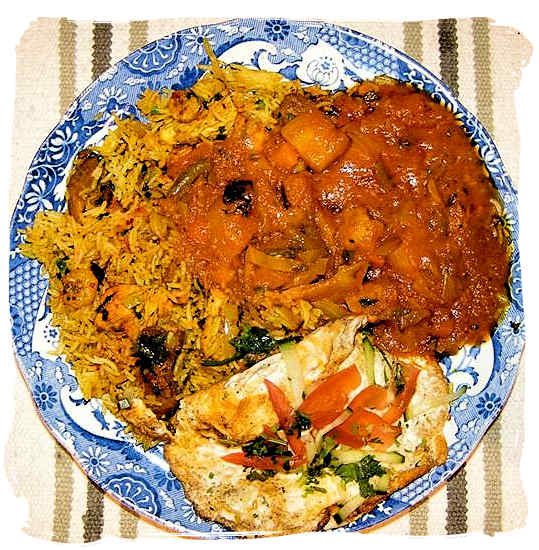 The result is delicious and makes the perfect complement to any South African-Indian dish. The avocado pear is the tropical pear-shaped fruit from the avocado tree, which grows in the northern parts of Mpumalanga and KwaZulu-Natal and the north-east of Limpopo. 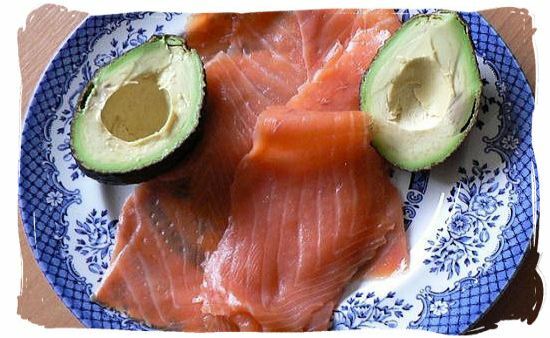 The avocado is very popular in vegetarian cuisine, making an excellent substitute for meats in sandwiches and salads because its high content of monounsaturated vegetable fats. The fruit is not sweet, but fatty, strongly flavoured, and of smooth, almost creamy texture. The flesh is deep green near the skin, becoming yellowish nearer the single large, inedible ovoid seed. Avocado is popular in chicken dishes and as a spread on toast, served with salt and pepper. 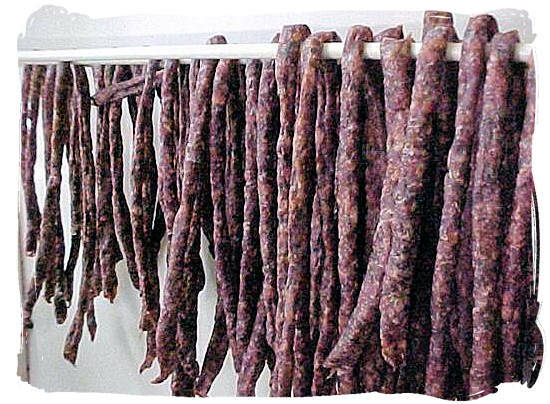 For the "Voortrekkers" and the black people on the move in the old days there was only one way of preserving their surplus meat and that was by means of curing and drying. 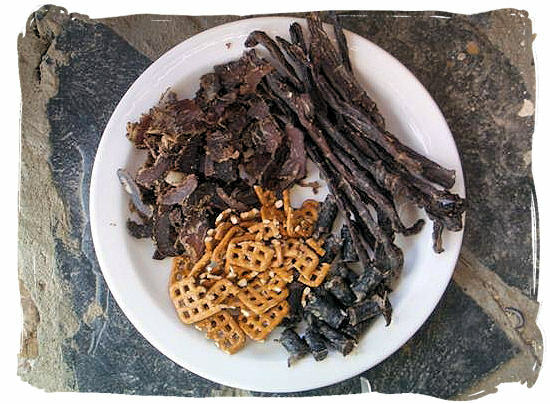 Today this cured and dried meat is known as Biltong, a famous and popular snack in South Africa, as popular as chips are in the rest of the world. The meat is marinated with rock salt, dipped in vinegar and then sprinkled with ground pepper and coriander, after which it is air-dried in a relatively cool environment. The cool and dry air of the winter in the South African interior is just perfect for this. Commercial production is done in refrigerated and humidity controlled rooms. 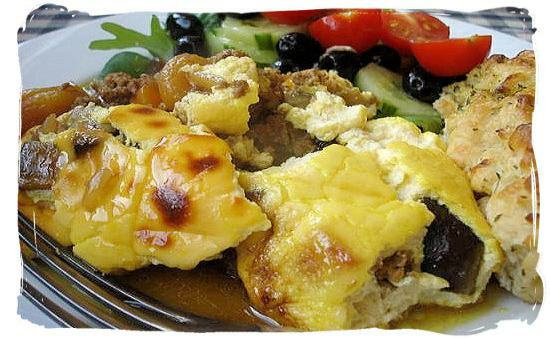 Bobotie is a highly popular traditional dish in South Africa. Introduced by the Cape Malays in the 17th century, it can almost be regarded as an indigenous dish. A little soaked bread is mixed with minced meat, preferably lamb and flavoured with a mixture of fried onions, curry, apricot jam, fried almond shavings and sultanas. The addition of lemon leaves (or alternatively lemon juice) gives bobotie its distinctive aroma. Halfway the cooking it is covered with a topping of egg custard to give it its attractive golden crust on top. A ceremonial food, normally prepared for special occasions, since it takes a long time to make. There are a multitude of recipes for biriyani and each one has a uniqueness about it. Chicken or lamb is marinated in a spicy yogurt mix and the rice is flavoured with cardamom, cumin and cinnamon. Layers of marinated meat and fried potatoes are packed into a pot and these are topped with rice drizzled with saffron. In some instances nuts and sultanas are added just before serving. The pot is sealed and steamed in the oven. It always tastes better the next day since the fusion between the spices and the flavours of the meat, vegetables and rice improves with some time. 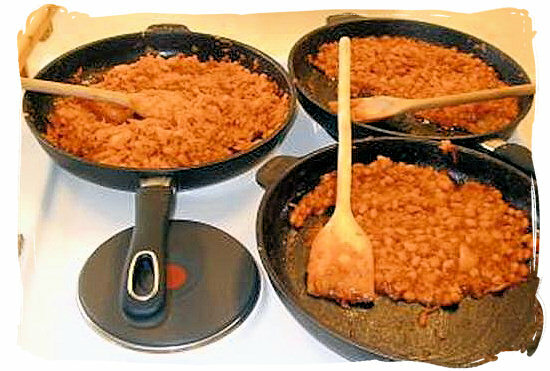 An inheritance from the German settlers in the Cape colony and popular with our pioneering forefathers the "Voortrekkers", who used to combine coarsely minced meat and cubed speck (pork and / or beef) with spices and preservatives (vinegar). Over centuries it gradually evolved to what we know today as "Boerewors". Although it comes in many varieties, The traditional "Boerewors" is a somewhat coarsely textured sausage, usually consisting of 50% beef and 50% pork, flavoured with spices such as coriander, cloves, nutmeg and allspice. Highly popular at "braais" (barbecues), where it is grilled over hot coals. Like biltong, it has become an institution in South Africa. 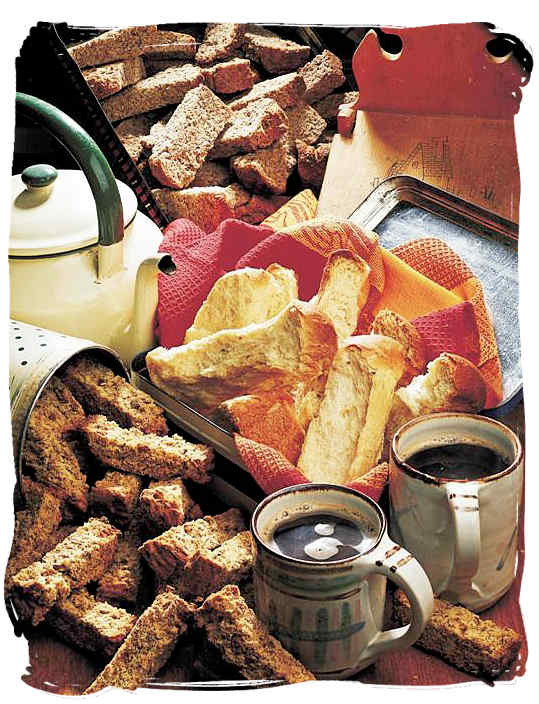 Literally meaning "farmers rusks", a South African food legacy from the Voortrekkers’ nomadic way of life. When it was hard to keep things fresh, drying proved to be a good preservative. Bread was baked, cut into blocks and then dried in the oven. Today there are hundreds of recipes and varieties. Dipped in coffee, tea or milk to make it soft, it is a delightful light breakfast very early in the morning. Once tasted, most people want more. The cooking of the "Voortrekker" pioneers evolved into the "Afrikaner boerekos" cuisine as we know it today. 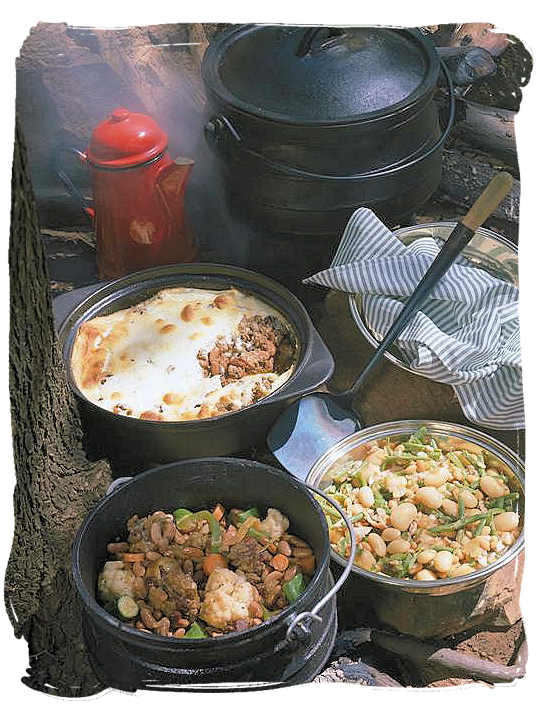 It is a traditional and country style of cooking that is enjoyed in particular by the Afrikaans speaking descendents of the "Voortrekkers", who call themselves "Afrikaners" (Literally meaning Africans). Normally you will find four main ingredients on your plate, namely meat, lots of starch (rice and potatoes) and pumpkin or vegetables. That could for example be roast leg of lamb, fluffy white rice to soak up the lamb gravy, crispy roast potatoes, pumpkin fritters with a sweet syrup and "boereboontjies" (crushed green beans). Delicious and deeply satisfying. 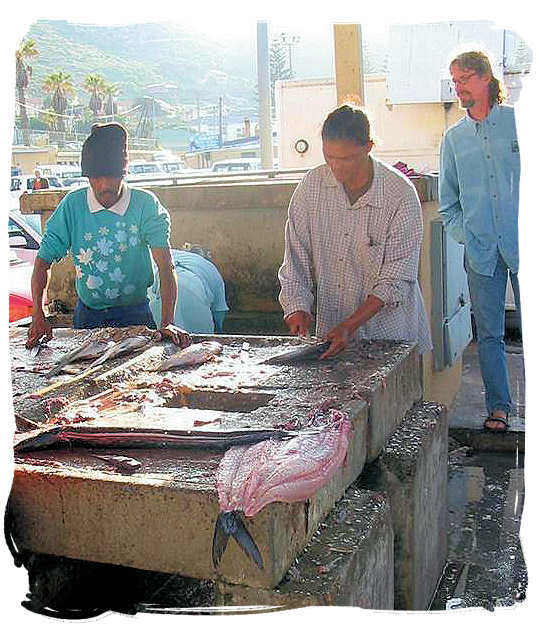 Bokkems are salted and wind-dried fish, usually "harders" (mullet) or "maasbankers" (horse mackerel), which formed an important part of the daily diet in the cape, particularly along the west coast. They are layered in a container, salted liberally with coarse salt and left overnight in a cool spot. 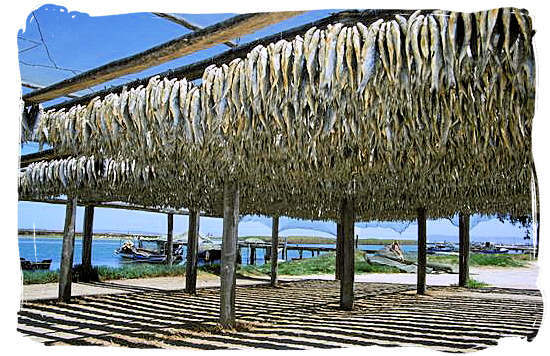 The next day they are taken from the salt, rinsed lightly, tied in bunches with twine threaded through the heads and hung outside to dry in a cool spot with enough air circulation. When dried and crisp enough for your liking they can be eaten as a snack food like biltong. It's difficult to determine how and when South Africa's "braai" culture originated. There wasn't much choice for the Khoi people, the Bantu people and later the Voortrekkers with their nomadic lifestyles but to cook and grill over open fires. South Africans won’t easily let anything get in the way of a good "braai", not even the weather. Come rain or sunshine (fortunately it’s mostly sunshine), they just love it. For them a "braai" is much more then just a way of cooking. It has become a way of life. 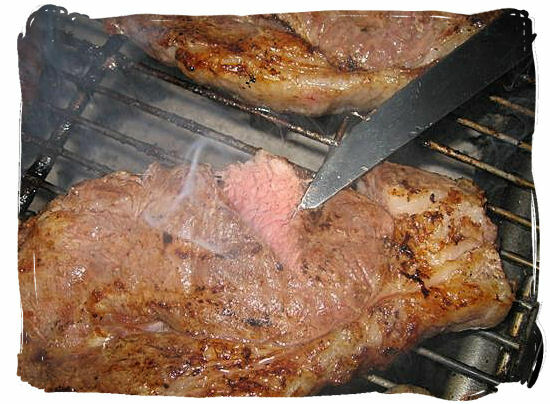 In the past "braaivleis" (barbecued meat) meant just that, grilled meat served with "mieliepap"(maize meal porridge). Today however it has become part of everybody’s lifestyle and also more sophisticated with marinated steaks, lamb and pork chops, spicy "boerewors" (farmers sausage), tasty spareribs, venison and kebabs. 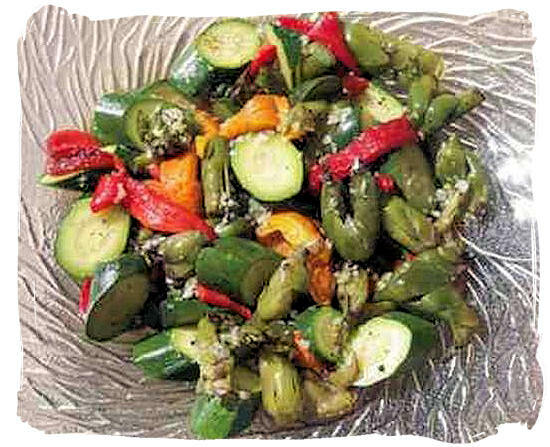 Side dishes include "mieliepap", a variety of fresh salads, pot bread, herbed bread, grilled mushrooms and vegetable stir-fries. 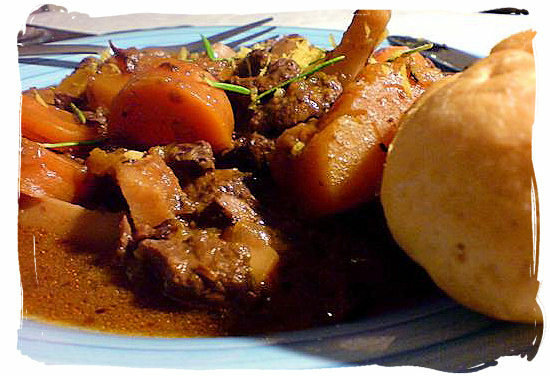 An old Cape colony name for a ragout type of stew of meat (usually mutton) and vegetables stewed together so that the flavours intermingle to create a unique taste experience. It is called "bredie", derived from the Madagascan word "bredi", introduced by the slaves who arrived in the Cape Colony, some of them of Madagascan origin. It scores high in the South African food popularity stakes. 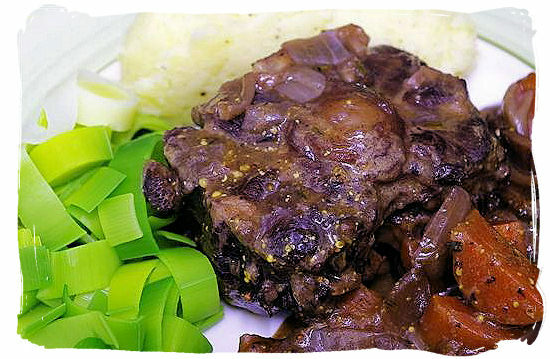 What gives a bredie its unique character is the long and slow simmering until the meat and vegetables melt together in a rich, thick and full-bodied gravy, which is obtained by using meat with a fair amount of bone and fat, rolling it in flour and browning it before the vegetables are added. In addition to potatoes and onion there is usually a dominant vegetable such as cabbage, beans or pumpkin. 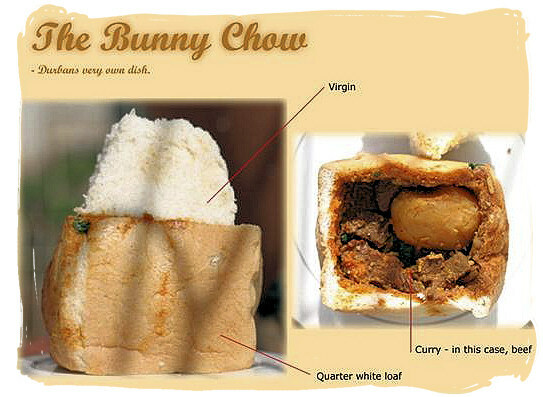 The Bunny Chow (called "bunny" by the locals) was meant as an inexpensive take-away food, consisting of a hollowed out half loaf of bread filled with a vegetable or meat curry and capped with the bread (the virgin) that was scooped out of the loaf. 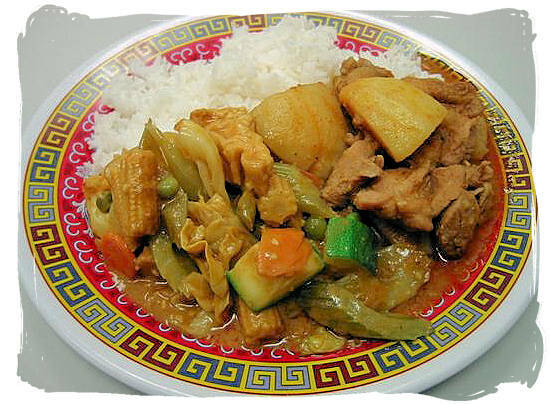 Although the original Bunny was strictly vegetarian, nowadays mutton, lamb, chicken and bean curries are the more popular fillings. They are often served with a side dish of grated carrot, chilli and onion salad, commonly known as sambals. 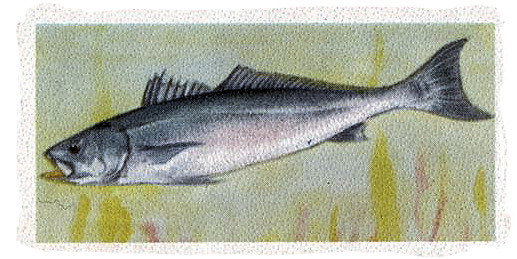 A silvery-grey, salmon-like fish with a bright yellow mouth and yellow inner surface of the gill covers, caught in the waters around the Cape peninsula. In the Afrikaans (Dutch) language it is called "geelbek" (yellow mouth). So It’s not only the Canadians, the Scots or the Norwegians who have fabulous salmon. South Africa's "Cape Salmon" is a South African food delicacy that appears regularly on menus and it is well worth a try for its succulence and rich colour. Its firm pinkish-grey flesh is best baked or grilled with frequent basting as it has a tendency to dry out. A delicious relish, highly popular, in particular with the black people. There are a multitude of recipes and ingredients that are often included are onions, tomatoes, green peppers, carrots, cabbage, baked beans, curry powder, peri-peri, chillies, ginger, fresh coriander and whatever the cook feels will distinguish his or hers from anyone else’s. It’s vegetarian, it’s spicy, it’s hot. People disagree as to whether this popular dish is a sauce, a side dish, or a salad. It is often served with "mieliepap" (maize meal porridge) and therefore used as a sauce. 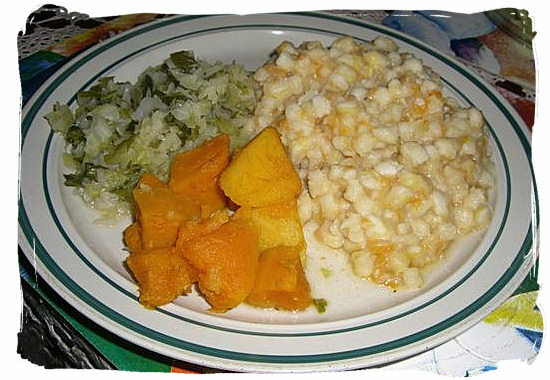 But it is also used as a side dish when served with "samp", (another maize dish) and stews. Chakalaka is said to have originated in the townships of Johannesburg. 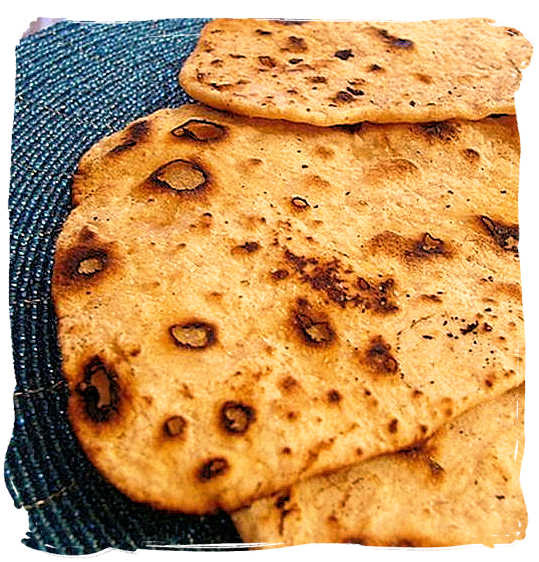 Indian unleavened flat-bread made from whole meal or "ata" flour, introduced in South Africa by the Indian and Malay people. Chapatis are eaten with curries and all Indian savoury dishes, using it in pieces to scoop up the food. It is a type of roti or Indian bread made from a dough of flour salt and water. Balls of dough are rolled out thin into discs of approximately 12 cm in diameter and baked in a very hot frying pan. Each disc is then held for about half a second directly into an open flame, causing it to puff up with steam like a balloon. Served to accompany any meal, or for breakfast or a snack. 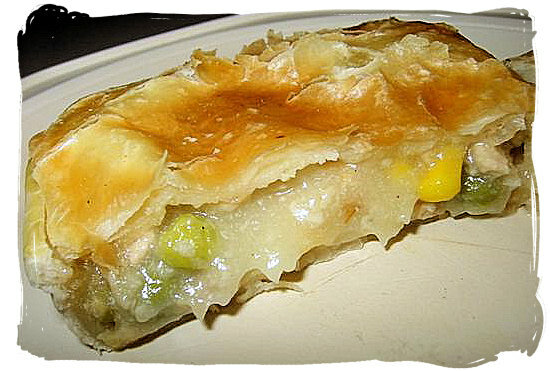 Having evolved from the traditional pot food of the early days in combination with the British love for pies, South Africa’s "Boer" chicken pie or "Hoenderpastei" (Afrikaans for chicken pie), is a unique South African food experience. It is basically a pastry filled with chicken and vegetables in a thick and creamy gravy-like sauce, with some bacon and ham for added flavour topped with a pastry crust. The term chutney comes from the East Indian "chatni", meaning "strongly spiced," and is described as either a sweet, hot or sweet/hot pasty type of sauce, which usually consists of a mix of chopped fruits, vinegar, spices and sugar cooked into a chunky spread. Many chutneys are on the spicy-hot side, but it's easy to adjust the heat factor if you make your own. 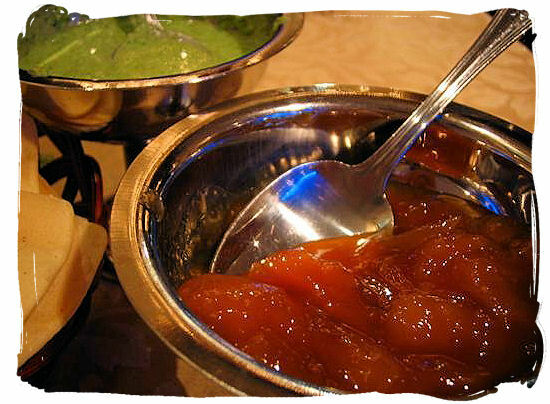 Although most chutneys have a fruit base, many non-sweet vegetables are also used. Firm fleshed and under-ripe fruits such as mangos, bananas, peaches, apples, nectarines, apricots are usually preferred, to maintain a chunky spread type of consistency. Although chutneys are traditionally served with curried foods, they also go well with meats such as venison, beef, pork and chicken. South Africa's crayfish is not truly crayfish, it is in fact spiny rock lobster, easily distinguishable by their lack of claws and their long, thick and spiny antennae. Whether right or wrong, in South Africa we call them crayfish. One of the delights of the country’s seafood cuisine, it is considered by many as the most desirable of all sea foods. Turning a bright red when cooked, they are usually eaten with the fingers and the sweet, succulent meat is picked or sucked out of the shell. 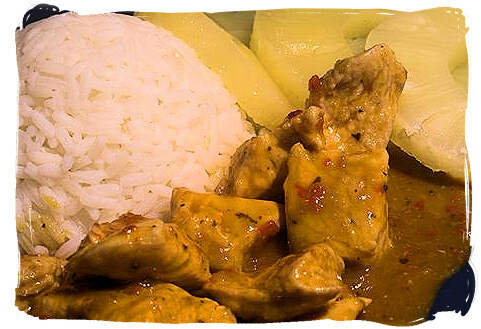 A good-quality Indian curry with its powerful and yet subtle taste is a mouth watering South African food experience. Served sweet, mild or hot they are usually a mixture of fresh garlic and ginger pulp lightly fried together with chillies, onions and a blend of what are known as the "C" spices, cassia, cumin, coriander, cardamom, cloves, chillies and cinnamon. Added to this are chopped tomatoes and finally the meat, seafood or vegetables. This spicy stew is usually eaten with rice and a sambal side dish. 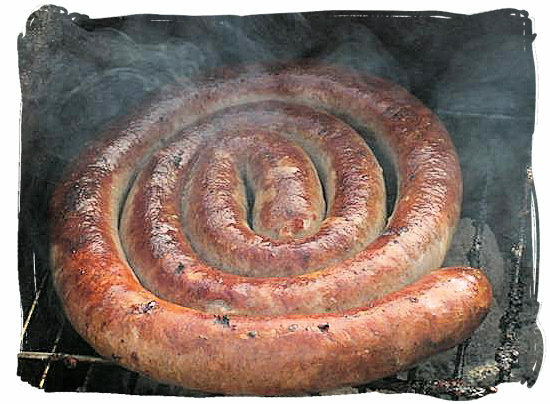 Droëwors (dried sausage), evolved together with the "Boerewors" (farmers sausage). Surplus sausage that wasn’t eaten was preserved by drying it. As a snack it is almost as popular as "Biltong". The ingredients such as coarsely minced beef and mutton, flavoured with spices such as salt, black pepper, coriander, cloves and nutmeg, are basically the same as for “Boerewors”. 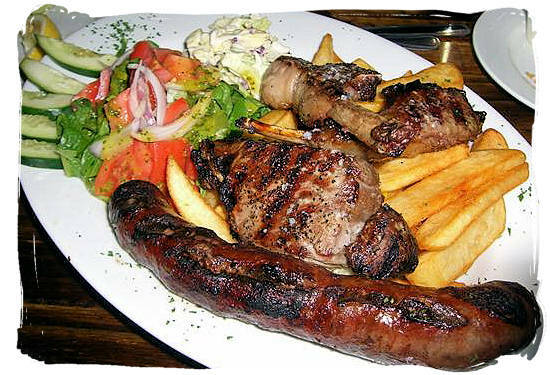 Fried sausage is thinner then "boerewors" and nowadays mutton and sometimes venison is used instead of pork, as pork fat tends to go rancid. To improve the flavour, droëwors may be smoked after a day of hanging, then retuned to continue the drying process. "Souskluitjies" is an Afrikaans word in the South African food dictionary that literally means sauce dumplings. A legacy from the German settlers of the early Cape Colony days, it is thought that "Souskluitjies" have developed from the German dish of "Dampfnudel", which was made by cooking small balls of yeast batter in a shallow sauce pan with milk. These would be served with jam as a desert or with gravy and meat , hence the name "souskluitjies" ( sauce dumplings). 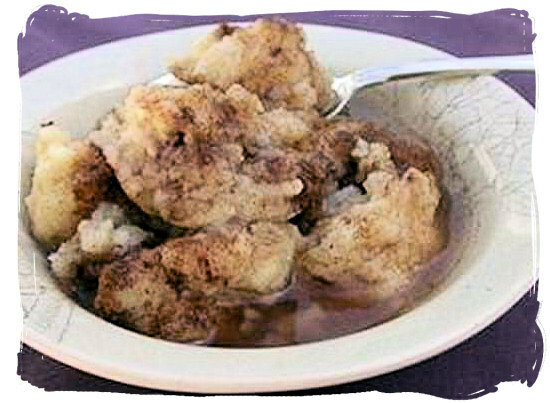 Today "souskluitjies" are made either by dropping balls of dough in a pot of stew or soup turning them into a savoury dish, or by cooking them in a flat pan with water, to be served as a warm desert topped with butter and a delicious syrupy custard sauce. 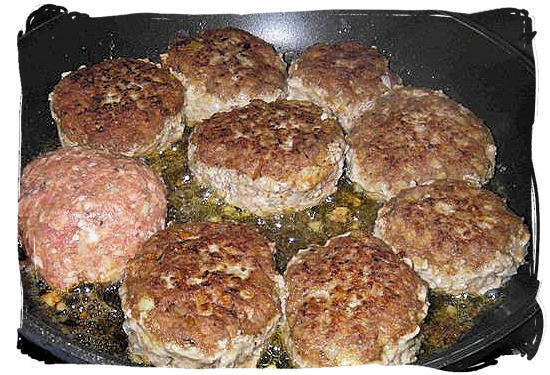 Most nations have some form of meatballs or meat patties in their culinary make-up. They come in a variety of shapes, sizes and methods of preparation. In South Africa we have our traditional "Frikkadel" (round meat ball or flat patty), highly popular with all its cultures. It is made from lightly spiced (salt and pepper) minced beef, mixed with white bread (soaked in milk and then squeezed out), finely chopped onion and beaten egg. To make it more spicy, a few dashes of Tabasco sauce, some finely chopped garlic, or a finely chopped chilli or two could be added. Try it on a "braai" (barbecue), absolutely delicious. 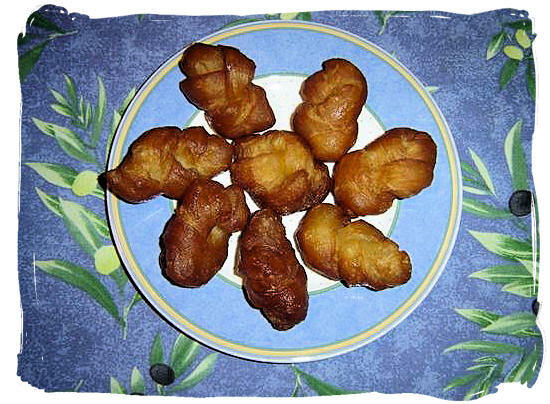 "Koeksusters" (literally cake sisters) are somewhat similar to doughnuts, as they are also sweet doughy fritters, but that’s where the similarity ends. They are also a legacy from the Cape Colony days. The "Afrikaans" speaking community maintain that the "koeksuster" was introduced by there Dutch forebears when they colonized the cape. The Cape Malay community on the other hand, claims this delicious sweet pastry as a product of their original cuisine. They are made from strips of dough about 6cm long that are plaited together, after which they are deep-fried in hot oil until crisp. When done the "koeksusters" are taken from the oil and immediately soaked in cool syrup, after which they are allowed to cool on a paper towel before eating. The Cape Malay variety is less sweet, more spicy and more doughnut like then the "Afrikaner" version. This dish is made from Mopani worms, which look like caterpillars in appearance. Their habitat is in the Lowveld areas of the Mpumalanga and Limpopo provinces, where they live in and around there food source, the mopani trees. Somewhat stringy, this exotic South African food is usually fried, grilled or cooked, spiced with chilli and often eaten with peanuts. Alternatively they can be preserved by smoking them or by drying them in the sun. It is said the taste is mild and unobjectionable, or even "flavourless", and crunchy when dried. Mashonzha is often served with "mieliepap en sous" (maize meal porridge and tomato chilli sauce). It is very popular with the Shangaan, Venda and Bapedi people in the limpopo province. Maize was grown by black tribes across Africa south of the Sahara long before the colonists arrived. Ground into either fine or coarse "mieliemeel" (maize meal), it has been the main ingredient for Southern Africa’s staple food "mieliepap" (maize porridge) for many centuries. The types of "mieliepap" as we know it today, are "stywe pap" (stiff maize meal porridge), fine-grained, firm and smooth, almost a bit doughy and "krummel pap" (Also firm, but more dry), rough-grained, firm and crumbly. For breakfast "mieliepap" is enjoyed in a more liquid and runny form, with milk, butter, cream and sugar. "Stywe mieliepap" (stiff maize meal porridge) is traditionally eaten by hand, taking a peace from the cooking pot and dipping it in a tasty sauce. 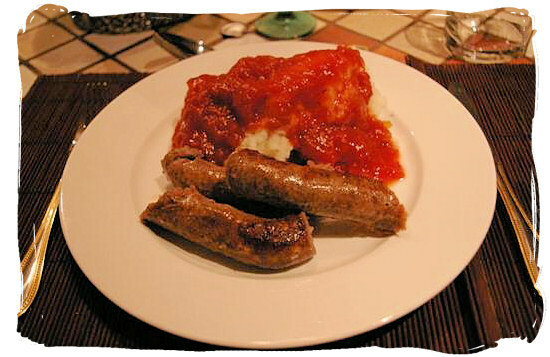 "Mieliepap" is a favourite side dish with a "Braai" (barbecue) or with "Potjiekos" (pot food). 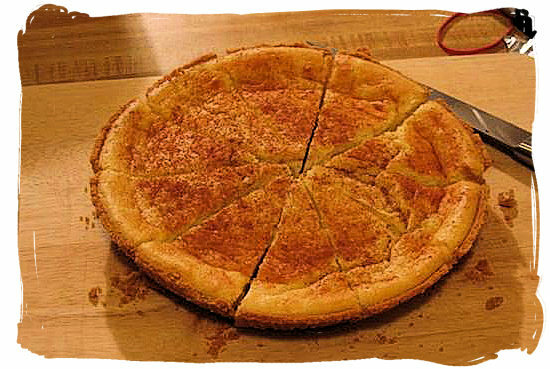 Few South Africans can resist a slice of fluffy "Melktert" (milk tart), rich in milk and sprinkled with cinnamon on top. It consists of a sweet pastry crust, filled with a creamy yet firm mixture of milk, flour, sugar and eggs, while custard is also often used. "Melktert" is another indigenous South African food golden oldie, having evolved from the egg custard pie introduced by the Dutch settlers in the early Cape colony days and modified by the Cape Malay slaves. General term for all the non-muscular parts of an animal left over after slaughtering a carcass. It is also known as variety meats. Some come from inside the animal such as liver, kidneys, entrails, lungs and heart, while others are external, such as tongue, feet, tail and head. 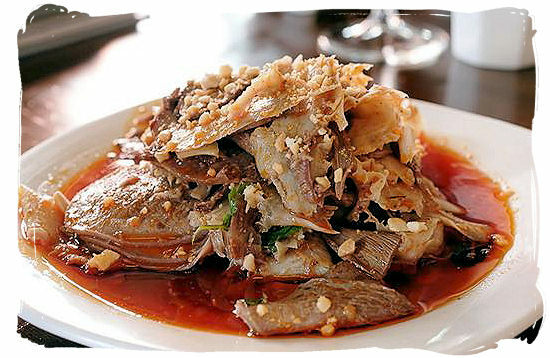 Offal from calves and lamb is considered to be the best, with a fine texture and depending on the type of organ, believe it or not, with quite unique and delicious flavours. It is either boiled or fried and served highly seasoned. Offal has been part of the human diet since the invention of cooking. For many South Africans offal is a treat offering them a unique taste and flavour sensation and for many of our cultures it is the highlight of the meal. Oxtails have been a popular menu item since the days of old and cooks around the world have made use of oxtails in a variety of ways to produce most delectable dishes. Though it is quite bony, the meat is robust and rich in flavour, making wonderful thick and hearty soups and very tasty gelatinous stews. Long and slow simmering is essential to get the meat succulently tender, while drawing maximum flavour from the bones and the marrow. Oxtail soups and stews are among the most comforting dishes of all, especially in the winter. Oysters have been a highly popular shellfish delicacy with food lovers for many centuries. They are easily identified by their rough and irregular shaped shells, the upper one flattish and the lower one concave, to provide space for the soft body of the oyster. The texture of the flesh of the oyster ranges from quite firm to soft and watery. 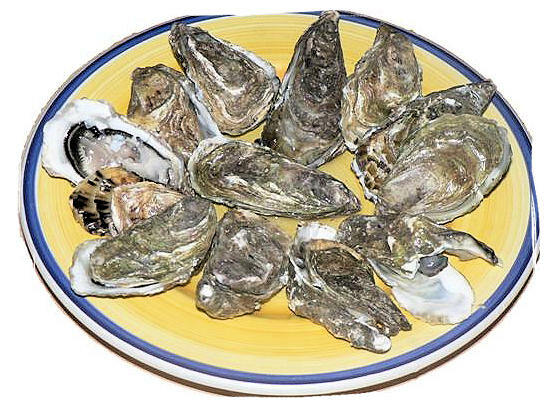 Oysters can be eaten raw, smoked, boiled, baked, fried, roasted, stewed, canned, pickled, steamed, broiled (grilled), or even be used in a variety of drinks. Raw oysters have complex flavors that vary greatly among varieties and regions: some taste sweet, others salty or with a mineral flavor, or even like melon. Cooked oysters are savory and slightly sweet-tasting. When eating raw oysters, make sure that they were fresh and alive before consumption. The "Afrikaans" (Dutch) name for Abalone, a shellfish somewhat snail-like, with a distinct head and muscular foot for movement inside a richly coloured shell witch is rough and mostly brown on the outside with a smooth "mother of pearl-like" finish on the inside. The thick muscle or foot with which the "Perlemoen" attaches itself to a rock, is edible. 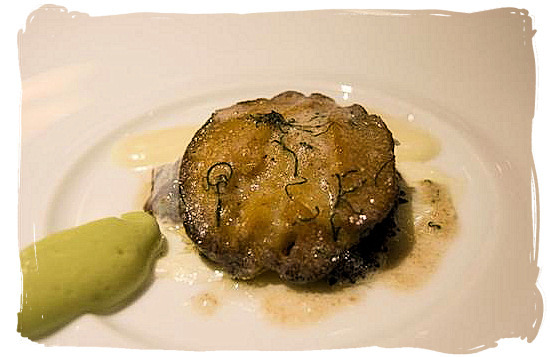 It is one of the sea’s most delectable offerings, with a delightful clam-like flavour. Taken from the shell the flesh is allowed to relax for at least 12 hours in a cool moist environment (refrigerator), after which it is rinsed and gently tenderized. Cut into thick slices and having trimmed off the frizzy parts, the Perlemoen (abalone) is fried in plenty of butter in a sizzling hot frying pan. This should not take longer then 1,5 minutes at the most, as overcooking will toughen the meat. "Peri-Peri" (Piri-Piri in correct Portuguese), is a very hot chilli pepper sauce, made from a cultivar of the chilli pepper called African birds eye (also called African red devil), which grows both wild and domesticated in Southern Africa. It is used in preparing sauces and marinades for roast and grilled dishes, especially chicken and various fish. It is made by warming sieved lemon juice and freshly picked, tremendously hot African birds eye chilli peppers and letting it simmer for exactly 5 minutes, after which it is salted and pounded to a paste, or dried and ground into a powder. The paste can be heated up again with more lemon juice. The end result is a basic "peri-peri" sauce that can be used over meats, fish, shellfish etc. Take care in using African birdseye chillies in the kitchen because of the extreme pungency of the pods. Poppadum is a flatbread from India, made with lentil flour. 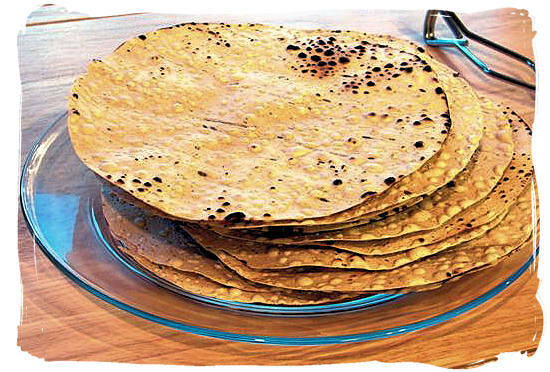 It is a very thin tortilla like bread that can be eaten either unseasoned, or seasoned with pepper or garlic. It is usually served with curry dishes. A dough is made with salt and peanut oil added to it, which can then be flavoured with seasonings such as for example chilli, cumin, garlic or black pepper. The dough is then shaped into a round and thin pancake like sheet, which can be cooked by deep-frying, roasting over an open flame, toasting or microwaving. Deep-fried poppadums puff up to almost double their original size. Grilling them over an open flame will give them a smoky flavour. They are normally served as an accompaniment to a meal in a variety of sizes. The smaller ones are often eaten as snack chips with dips, while the larger ones can be used as wraps. "Potjiekos" ( literally meaning pot-food) has been part of South Africa’s culture for many centuries. When the first Dutch settlers arrived in the Cape, they brought with them their ways of cooking food in heavy cast iron pots, which hung from the kitchen hearth above the fire. "Potjiekos" evolved as a stew, made of meat and vegetables (if they were available). Surplus meat was preserved by seasoning and drying. The fire is an important part of creating a culinary "potjie" masterpiece. You only need a few glowing coals to keep the "potjie" simmering. When making your "potjiekos", the meat usually comes first. Add a dash of cooking oil or some fat in the pot, add the meat and brown thoroughly. Cook the meat till nearly done. Now pack in the layers of vegetables in order of their cooking times, like carrots and potatoes first and thereafter sweet potatoes, pumpkin, mushrooms etc. Heat up the "potjie" and let it simmer for a couple of hours till it's ready. Add a little liquid when the food tends to cook dry, but only a little at a time as watery "potjie" is not nice and too much flavour is lost. When ready, stir once to ensure an even mix of meat and vegetables, serve with "mieliepap" (maize porridge) or rice with salads and enjoy a memorable meal. The word "prawn" is used to mean different things in different parts of the world, most often it is used to mean shrimps, especially the larger species. 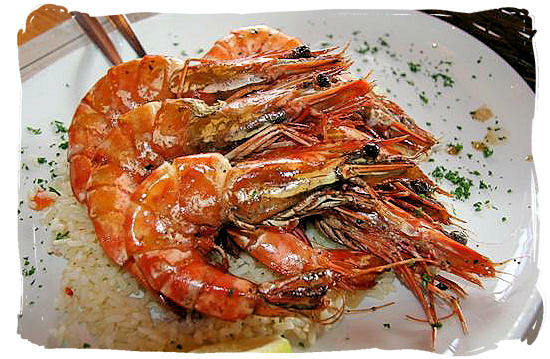 In South Africa when we use the word "prawn", we talk about the super large and delicious Mozambique prawns or LM prawns. LM is an abbreviation of Laurenço Marques, the capital city of Mozambique where our prawns come from. It has been renamed and is now known as Maputo. The size of a prawn can vary drastically, from the small shrimp used in shrimp cocktails to the large tiger prawns. Tiger prawns are a meal on their own and taste absolutely sensational, especially when marinated in a "Peri-Peri" sauce, which is the traditional Portuguese-South African way. When cooking prawns, each one is first straightened out flat, and a small incision is made along the back The digestive tract is then pulled out of this incision, because it tastes very bitter. 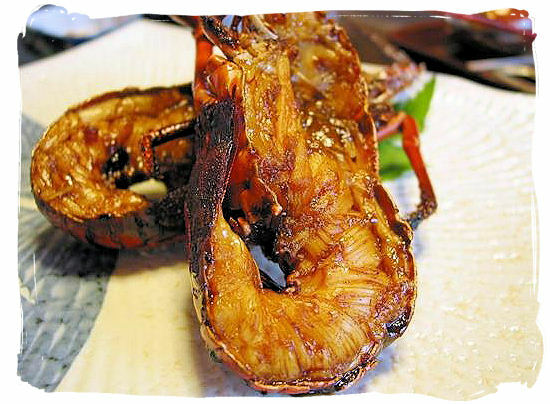 The prawn is then prepared in a batter of wheat flour and beaten egg, and deep-fried in hot cooking oil. After frying, the head is usually not taken off because some people prefer to eat the head, which becomes crispy. Apart from "Peri-Peri" they are also often eaten with either Worcester sauce, lemon juice, or tartare sauce. This popular herbal tea, unique to South Africa, is produced from the slender stemmed "Rooibos" (red bush) shrub, which is found in the Cedarberg area, about 200 km north of Cape Town in the Western Cape province. "Rooibos" tea has no caffeine and less tannin then our common tea. It has a distinctive red colour and a unique taste with a very sweet and somewhat nutty flavour. 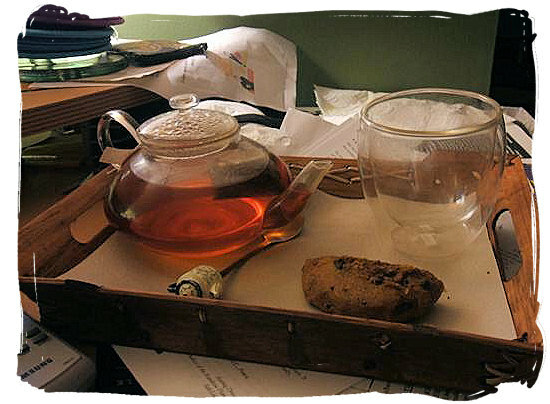 In South Africa it is more usual to drink rooibos with milk and sugar, but elsewhere it is usually served without. Preparation of "Rooibos" tea is essential the same as ordinary black tea except that it gets better and better the longer it is brewed. The resulting brew is a reddish brown colour, which explains why rooibos is sometimes referred to as "red tea". According to studies conducted in South Africa and Japan, "Rooibos" tea has been shown to aid in health problems such as insomnia, irritability, headaches, nervous tension, and hypertension. Introduced by the Cape Malays in the 1700s, sambal is made from chilli peppers as a pasty condiment, often with raw fruits or vegetables. Used as a side dish and sometimes as a substitute for fresh chillies, there's only one way to describe it, and that is...red hot. there are many different sambals, each with a different taste. 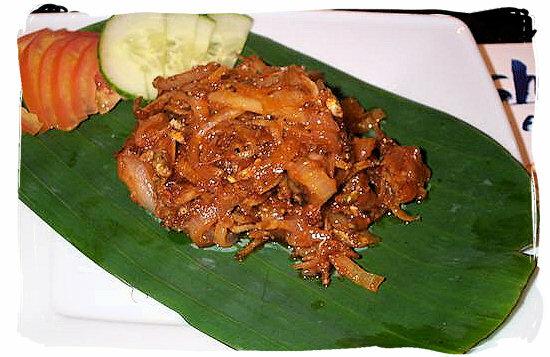 One of the best known ones is Sambal Oelek, which is also the most simple one. It is made by dry-roasting chilli peppers in a hot frying pan for 2 to 3 minutes. Cool and chop finely, then pound to a paste with some salt and sugar. The seeds may be taken out or left in if you want it extra hot. This sambal adds heat to a dish without altering the other delicate flavours. Indian in origin but also favoured by the Malay community, samoosas are deep-fried triangular / pyramid shaped pastries, traditionally filled with a savoury potato, onion and pea mixture, although in South Africa other fillings like minced meat, fish or just vegetables have also become very popular. 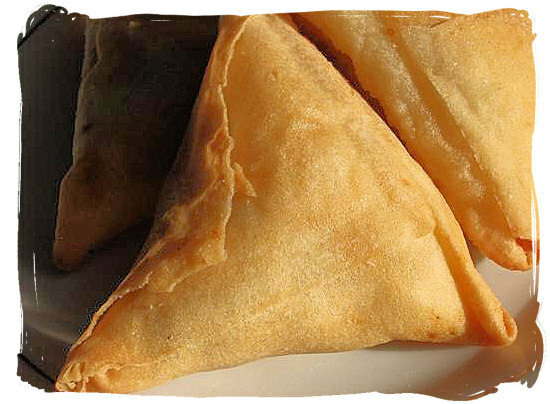 The size and shape of a samoosa as well as the consistency of the pastry used, can vary considerably. A popular snack food throughout South Africa, it is spicy and often eaten with chutney. It can however also be in a sweet form, rather then a savoury one. Samp consists of dried maize (corn) kernels that have been stamped and pounded until broken but not as fine as Maize-meal or maize rice and then simmered for a couple of hours until soft and done. The coating around the kernel loosens and is removed during the pounding and stamping process. The dish is a favourite with the Xhosa people and they often combine it with beans to make a dish called Umngqusho, said to be a favourite of Mr. Nelson Mandela. It is often eaten with chakalaka and served with beef, lamb or poultry. No fish is more traditional to the Cape then this fierce predator of the sea, a relative of the Barracuda. It should be eaten or preserved soon after catching or else the flesh tends to soften. This South African delicacy can be enjoyed either smoked, grilled, baked, fried or poached. It is served with lemon, garlic, dried chillies and melted butter for extra flavour. Wrapped in foil with onion, green pepper and tomato slices and barbequed over hot coals is also a South African favourite. It makes delicious hors d'oeuvres, soufflés, quiches and pâtés. 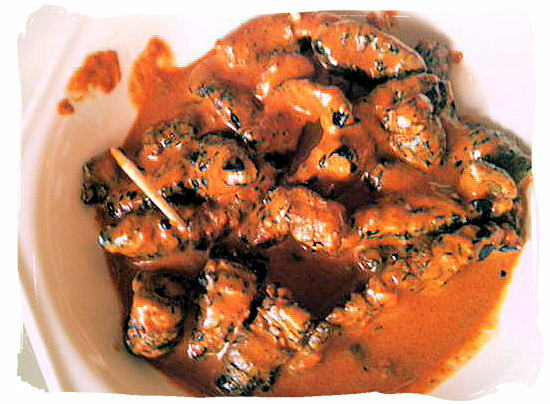 "Sosaties" are a good example of the Malay influence on South Africa’s cuisine. The word 'sosatie" comes from the Indonesian words "sesate" (skewered meat) and "sate" (spicy sauce). 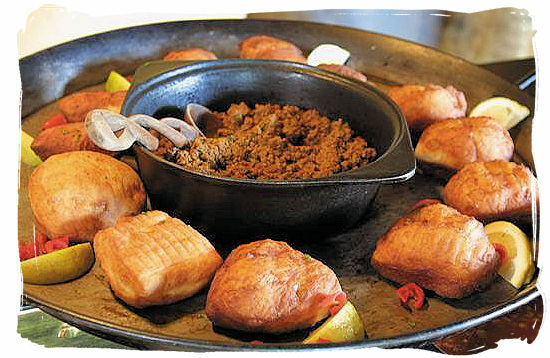 They are a unique example of an original Cape Malay Muslim dish that did not contain pork, but sheep-tail fat. 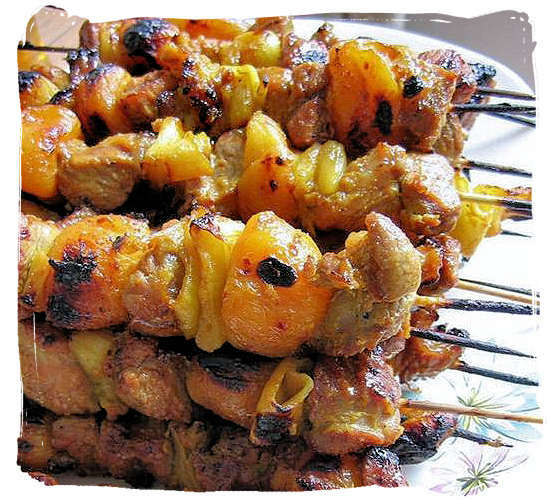 The true Cape Malay "sosaties" are made with small pieces of lamb, threaded on thin wooden skewers, with small cubes of sheep-tail fat or bacon or speck (preferred by non-muslims), onion and apricot in between. The meat and the fat is marinated for up to 24 hours in a mixture of fried onions, apricot jam, garlic, pepper, salt, curry powder, turmeric, bay leaves, sugar and vinegar, to create the true "sosatie" flavour. If other kinds of meat or fruits are used, it's not a true sosatie, but rather a kebab. "Vetkoek"is a traditional Afrikaans pastry. It is thought to have its origins in the Dutch "oliebol" from the days of the first Dutch settlers in the cape. Literally it means "fat cake", which refers to the method of frying only and not the bread itself. The history of "vetkoek" as we know it today, goes back to the days of the Voortrekkers who found it much quicker and easier to make than bread, when on the move. They are lumps of bread dough which are deep-fried in hot oil until they turn golden brown. Typically South African, they should be eaten while still warm, filled with either savoury mince or just butter and jam. As a snack or as fast-food it can be served any time of the day. "Waterblommetjiebredie" is a unique South African culinary experience. It is a stew made with "Waterblommetjies" (water lilies), which are found in shallow dams and glens of the southern part of the Cape province, from about May to November. With typical Malay creativity they are combined with the slightly tangy taste of sorrel and the full-bodied flavour of mutton into a delicious stew with a fine balance between salt, savoury and somewhat sour tastes. The taste has been described as almost like green beans with a hint of pumpkin and the slightest bit of "pond" taste about it.